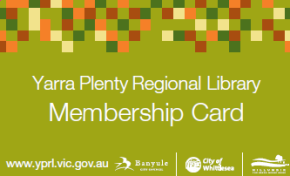 Yarra Plenty Regional Library (YPRL) is a library service comprising nine branch libraries located across the three member Councils of Banyule, Nillumbik and Whittlesea. YPRL supports all three Councils in their aims for connected and resilient communities and supports these strategies through our curated collections, public programs and welcoming spaces. Yarra Plenty Regional Library enjoys a reputation as an innovative, progressive and effective library service. There are nine branch libraries located at Greensborough, Eltham, Ivanhoe, Lalor, Mill Park, Rosanna, Thomastown, Watsonia and Whittlesea, as well as two mobile libraries - the Mobile Library and Outreach Vehicle – and a home library service. We will provide opportunities for our diverse communities to read, learn, create and connect, supported by equitable access to collections, technology, programs and welcoming and safe spaces. We aim to be the ‘third space’ after home and work or education, and to be regarded as the community lounge room. Yarra Plenty Regional Library was founded in the mid 1960s, when the former City of Heidelberg agreed to provide library services to the former Shire of Eltham. Later the former Shire of Diamond Valley and the Shire of Whittlesea joined in the regional group. In 1995, following changes in local government boundaries, the new municipalities of Banyule, Nillumbik and Whittlesea continued their support for the regional library service and Yarra Plenty was one of the first regions incorporated under Section 196 of the Victorian Local Government Act 1989. Since 1997, YPRL also provides computer services to Murrindindi Library Service, including full access to the library’s database.